CHICAGO (WLS) -- Severe storms brought heavy rains, large hail and damaging winds - and possibly a tornado - to the Chicago area Tuesday evening. A Tornado Warning issued for Kankakee County expired at 11 p.m. No touchdowns were confirmed Tuesday night, but wind damage was reported in the St. Anne area. A Severe Thunderstorm Watch for the entire Chicago area and northwest Indiana was canceled just before midnight. 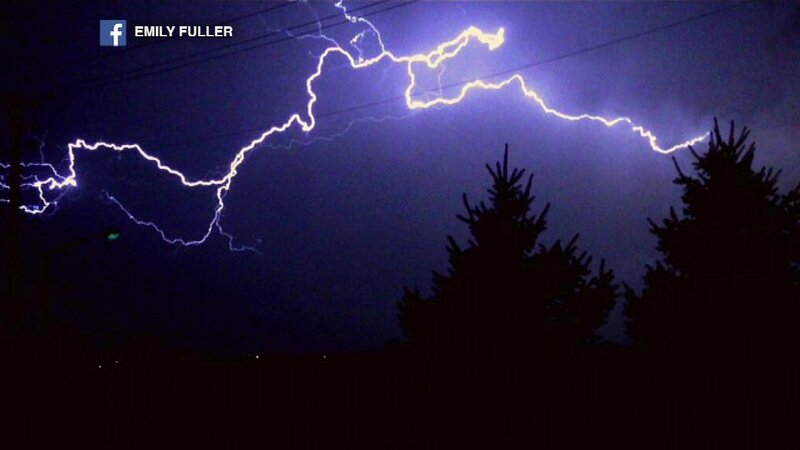 While the threat of severe weather has diminished, thunderstorms will continue moving through the Chicago area overnight, ABC7 meteorologist Jerry Taft said. The primary threats include heavy rain, large hail and damaging wind gusts up to 70 mph. Mostly sunny and windy Friday. Highs around 60. If you are in the path of a severe storm, take shelter in the center of a basement, cellar, or the lowest floor of your home and protect yourself from flying debris. If you are driving when severe weather strikes, stop your vehicle and stay inside. Do not get under your vehicle. Avoid areas with trees and protect your head. A watch means conditions are favorable for severe weather, while a warning means severe weather is imminent. Stay tuned to ABC7Chicago.com and the ABC7 First Alert Weather Team for the latest on any severe weather that develops in the Chicago area.